Helpis minitabunda were a very common salticids found around my yard at Budgewoi. Since moving a little further up the coast to Bateau Bay I have seen none. They used to be found stalking along the vertical plane of the steel fence at the back of the yard, clambering up the walls or on wide areas among the plants such as Bromeliad leaves. They seemed particularly comfortable around the potted Bromeliads as there was water and food and they were not disturbed at times such as lawn mowing. In this area they seem to have been replaced by one of the Astia species which looks similar and is found on smooth-barked Eucalypts along the ridge of remnant dry coastal woodlands. 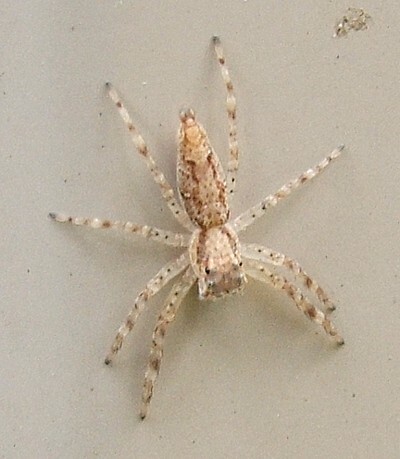 These little spiders tend to grow to about 10 mm long. They have amazing eyesight like all of the jumping spiders. They were not easily disturbed by the photographer. 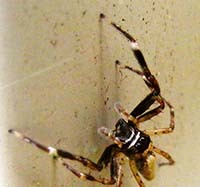 (Top) A male sipping droplets of water on the bathroom window sill. The different genders appeared like different species. 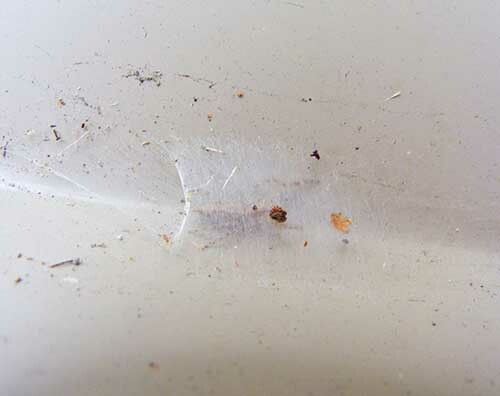 (Below) A female looking to escape attention beneath a silken roof. It is possible they ambush from these. 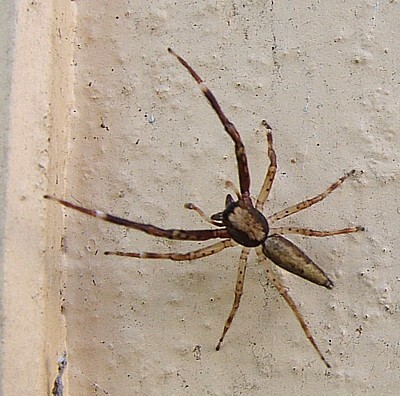 I have seen a White-tailed Spider break into one and eat the jumping spider. They may use these while pregnant or to lay eggs in.